Even though the Saints have experienced a lot of growing pains over the years since their 1967 inception, they have managed to pull out one Super Bowl win in 2009. The Saints actually did not even have a season with a winning record until 1979. They made their first playoff appearance in 1987 after coming of a 12-3 season, only to lose to the Minnesota Vikings. However, they posted their first post-season win in 2000, defeating the St. Louis Rams and only nine years would pass before they won it all. Saints Super Bowl rings are popular with the team's fervent fan base in the south. After Hurricane Katrina left them (along with many New Orleans citizens) homeless, the Saints began to rebuild under rookie head coach Sean Payton and the newly acquired QB Drew Brees. In 2009, the Saints posted a 13-0 record before losing their last 3 games and finishing 13-3 for the season. Shortly after, they carved through the playoffs defeating the Minnesota Vikings 31-28 and setting up a Super Bowl showdown with Peyton Manning and the mighty Indianapolis Colts. Although they trailed in the beginning, the Saints would pull through and beat the Colts 31-17 for their first (and only to date) Super Bowl championship. 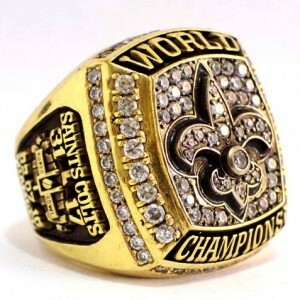 The 2009 replica of the Saints championship ring has been selling on eBay for as little as $190 and as much as $435. Most are made with solid brass and 18K yellow gold plating with AAA quality cubic zirconia (some are pronged and others are glued). Pronged and bezeled stones have overlapping edges and corners. They weigh around 40 grams with multiple sizes available. Some that have been sold have come with a black suede ring bag, but others include a large glass display case or a cherry wood display box with a name plate in front. Most of your top rated sellers will offer a money back guarantee. Replica Saints Super Bowl rings sell often on eBay but expect you'll have some competition because of the team's current popularity.